Who, even as an adult doesn’t get a giggle from wearing a cape? A spark of excitement, fun and a whisper of childhood. Summers of scratched knees and almost being able to fly. Superhero’s and fairy tales. Ironman, Green Arrow, Captain America, Superman, Spiderman, Thor (aesthetically Mummy’s favourite). These are very popular names in my household at the moment. They are the theme of the majority of our conversations, toy purchases and whose colourful faces are plastered on my son’s walls and socks. Learning through imaginary and dramatic play has long been recognised as an important component of child development. It is also important to be responsive to children’s emerging interests. I have become an expert in Hot wheels, hero’s and Ben Ten. Five reasons why Superhero play is good for children. 2.Role play develops verbal and non-verbal communication, it involves a lot of talking, ‘save me mummy the Joker has stolen my cake and is holding it for ransomed.’ Children apply language, learn new vocabulary and participate in discussions. Being a hero offers a perfect opportunity to talk about right and wrong with your children. They do good things, be kind to others. They have awesome hair. 3.Superhero’s are fast and strong; being little is tough! You have to learn lots of new things and overcome obstacles…learning to read, climbing stairs, tying shoelaces…children can feel well, really little. They get worried tummy aches. Superhero’s can help children feel brave, build their self-esteem and empathy in understanding how other people think. 4.Finally, my son once he dons a cape is all about the chasing, capturing, jumping, rolling…Being spiderman in the garden lends to a child’s physical development, improving their fine motor skills and all this physical activity can help to release tensions increase wellbeing. Superhero’s are not gender specific and I encourage my son takes interest in other things as little ones tend to become a bit obsessive. We do not watch any film above a U however much he pleads. I think superhero’s can get slack for the fact that they can become synonymous with rough and tumble, karate chops and accidently pulling off one of teddy’s ears. When you are five it’s all about actions and being loud; 12 boys in one class all ‘Batmaning’ it up means bumps will happen and at the age when boys have a first injection of testosterone things can get a bit destructive. Talk with children about stuntmen, about how in reality people can’t fly etc. Superhero’s like anyone else need boundaries. Fantasy, pretend play and wanting super powers are an important part of childhood. Get your cape on. Speak with a growly voice and own a cat. Most should wear makeup. Their choice of colour is mummy’s deep red No7 lipstick. They are angry because their mummy made them go to bed too early when they were five. Should always loose and then say sorry and give the hero a sorry letter. The best baddie is the Joker but his little figurine needs to be hidden at night. He’s a mischief. Enjoy flying, super speed, solving riddles and making witty quips all whilst wearing a mask and trying to plan what is for dinner. 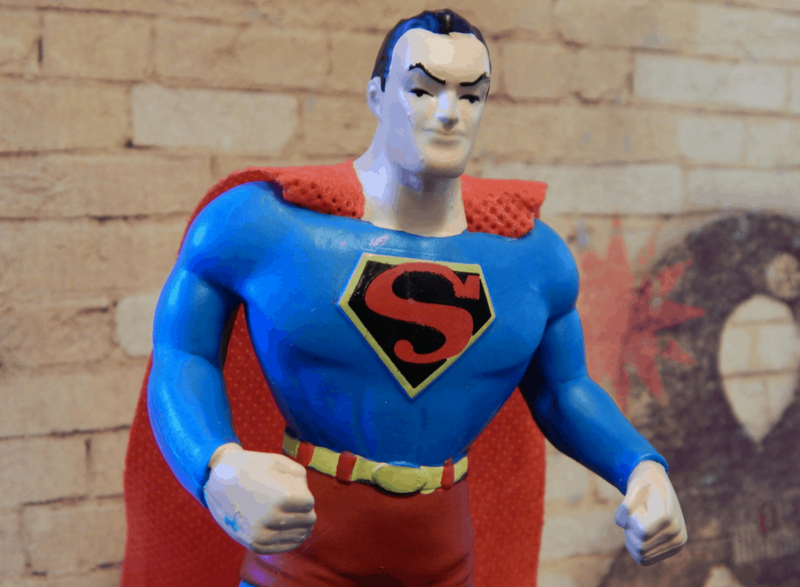 Do you have Superhero crazy offspring? Are you Avengers mad, or do you think children should not be encouraged to play with Batman action figures? We would love to hear your opinions! Remarkably sweet read. My kiddos are starting to phase out of this with age and I’m going to miss it. What a fun post. My son’s never been interested in superheroes (he’s watched Spiderman once – I didn’t think it appropriate for a 4 year old at the time, but he was fine with it and we watched it together on holiday), and doesn’t really do dressing up. But my 2nd cousin’s youngest daughter loves superheroes – Iron Man especially. My son is 16 now but I remember taking him on the Mersey Ferry and he was dressed in a Silver Thunderbird outfit, he never batted an eyelid and acted like it was his usual attire. They were fun days, now the only named clothes he wears are designers, haha. We have yet to discover super hero’s properly. I love their little imaginations, shows how easily their innocence can melt away discovering there are baddies in the world, and how to identify them in the films. If he wants to be wonder woman then why shouldn’t he? I’m with you on not being gender specific! Oh how sweet. I love seeing all the children at school dressing up as superheroes and saving each other! I made a Spiderman book corner (gotta love pinterest!) and it got so many of the boys in there – not always reading, but it’s a step in the right direction! My now 7 year old still loves dressing up as a super hero, I think its a great way to have imaginative play, which a big part of childhood. Spider Man has been bought in 3 different sizes now and is a firm favourite in our house. I think each one of your points is absolutely spot on, it’s so important out children learn these things. Your sons points are also very valid, he sounds like a very funny and thoughtful boy! Fantasy and imaginative play are essential parts of a healthy happy childhood. Children (and adults!) test out ideas and scenarios feelings and social norms in the safe world of fiction and role play. Characters and stories need to be age and developmentally appropriate of course but anyone who focuses on the perceived negative aspects is missing the point. Kids need rough and tumble. And contrary to what some adults think they can tell the difference between fantasy and reality! Lovely read. My son is also into Iron Man and Spider Man these days…. will not drink milk unless its from his Spiderman glass. Because he has to become strong like Spiderman? But on a more serious note, I agree, role play and imaginative play is so crucial to their development.